PHOTO BY JILL GOSCHE Mohawk’s Zach Hayman catches the ball as Hopewell-Loudon’s Jaret Nelson defends during the game in Bascom Friday. Hayman went on to score a touchdown on the play. BASCOM — Heading into the matchup Friday with Mohawk, Hopewell-Loudon coach Brian Colatruglio said the game would be a measuring stick for his Chieftains. For a half, they were right there. However, once Mohawk got some momentum and a growing lead in the second half, the Warriors buried the Chieftains 34-14. 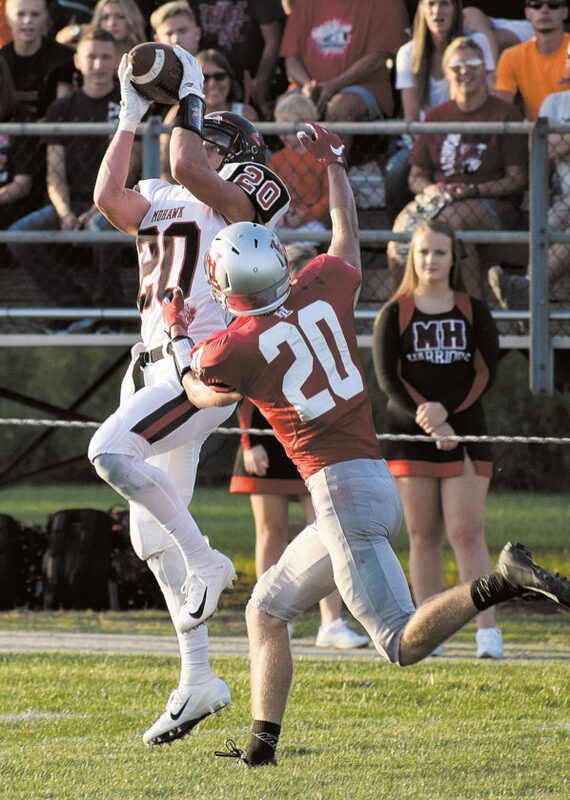 In a game that was reminiscent of the old Midland Athletic League, Mohawk’s 1-2 punch of Bryce Kirian and Jesse Leeth in the backfield wore H-L down. “I’m proud of how hard we hit tonight. We had some really good hits,” Mohawk coach Brent Konkle said. “I thought we were a lot more physical on defense than we were a week ago. The Warriors (2-0) threw the ball just five times Friday as Kirian carried the ball 22 times for 160 yards. Leeth backed him up with 16 touches for 90 yards and quarterback Keith Jenkins had 57 yards on the ground on 13 carries. They all scored a touchdown. As impressive as those Warriors were, Zach Hayman had himself a night. Hopewell-Loudon (1-1) drove the ball right down the field on its opening possession. At Mohawk’s 29-yard line, Hayman intercepted a pass at his own goal line. After Jenkins was stuffed on a QB run up the middle, Jenkins let the ball fly on a go route to Hayman, who out-jumped a H-L corner for the ball and took it to the house for a 98-yard score. The Chieftains once again drove the ball down the field and even got the ball inside Mohawk’s 5. However, quarterback Luke Jameson was sacked by Mohawk’s Cole Zender on a fourth-and-goal. Jenkins later ran in a 6-yard score to give the Warriors a 14-0 advantage with 7:17 left in the first half. On the ensuing Chieftains drive, Hayman recorded his second pick of the first half and returned it to H-L’s 38. Mohawk could have put a dagger into the Chieftains with another score before the half, but H-L stepped up and made a play. Jenkins was stripped and H-L’s Donovan Bickelhaupt recovered the fumble around midfield. As a result, Sam Stickley cut the lead to 14-7 with a 2-yard plunge into the end zone. “I told our guys that (this morning) we are going to talk about the turnover battle and who wins the battle on third downs and they clearly won both of those,” Colatruglio said. “Those were things we knew would be the keys of the game. We had two nice drives in the beginning of the game and had them on their heels a bit and missed a few shots to take the lead. Mohawk got the ball to start the second half and marched the ball right down the field. Kirian scored on an 18-yard run just four minutes into the second half. After a turnover on downs, Mohawk struck again, this time with Leeth. He scored from 5 yards out to open up the game with a 28-7 lead late in the third period. H-L showed some life after a Stickley 4-yard touchdown run a little more than two minutes later, but Mohawk answered. Hayman scored a 12-yard touchdown on a jet sweep to the right to put the Chieftains away. “I’m willing to do whatever they want me to do. I think they have a lot of faith in me to move me around, put the ball in my hands and trust that I’ll make the right decisions and be smart with it,” Hayman said. For H-L, Stickley had 95 yards rushing and Travis Milligan caught three balls for 54 yards. “They’re good. They have a group of seniors right now with most of those guys being three-year starters and they got the experience,” Colatruglio said. “That’s a really good football team. We’re trying to get there and we’re close.